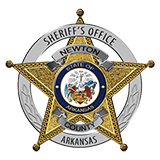 Newton County Sheriff Keith Slape said that the Sheriff's Office and the Arkansas State Police investigated a shooting at the ambulance garage December 21, 2010. Slape said that there was a knock on the door around 3:30 am and when the paramedic opened the door, Ricky L. Cooper, 52 of Jasper, shot himself in the head. Cooper was pronounced dead at the scene. " Mr. Cooper had been going through several personal problems" Slape said. Sheriff Slape said that Josh Blanton, 23 of Vendor, was arrested January 9, 2011 after a pursuti through the county. Slape said that the Sheriff's Office was called at 10:52 pm from a Ponca firefighter that his vehicle had been stolen from his yard in Boxley and that he was following it. Slape said that deputies and the Arkansas State police met the vehicle and attempted to stop the vehicle and the vehicle fled. Jasper Police Department attenpted to stop the vehicle on Hwy 7 but the 1985 Chevy Blazer ran the attempted stop. the vehicle was finally stopped on private property off of Co. Rd 58. Blanton was charged with theft of vehicle, fleeing, criminal mischief, and numerous traffic violations. Blanton was being held in Boone County Jail on a probation warrant for absconding.